After having my old wallet for over a decade I finally realized it was time to say goodbye after the binding and leather literally started falling apart. My previous wallet was a Coach fold over. 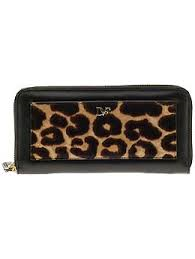 I wasn't sure what to get next until I found this DVF leopard wallet on sale at Piperlime. With an extra 15% off and rewards coupons it came in under $100.00. While it was hard to say goodbye, I am loving the extra room and organization of a continental zip wallet. I also love that it has enough style to pass as a mini clutch. After all, we women work in various ways so why shouldn't our wallets! What type of wallet do you like to carry? Do you change it out or carry the same one? Manner informed men and women preserve a few replica rolex that will go with using clothes. That they go with a enjoy good situation. Say for example a natural leather bracelet enjoy is definitely ideal for donning through weekends. This specific arm roelx replica watches demonstrates you are throughout lighting feelings along with you wish to have a great time along with leisure. Donning natural leather bracelet enjoy would likely demonstrate you are inside feelings for you to chat and still have a genial chitchat. replica rolex form of wristwatch anyone don could explain to a huge number of words and phrases with regards to anyone. Plus the company you ultimately choose could explain to with regards to final decision. Men and women decide on Maurice Lacroix since rado replica is the foremost watchmaker inside earth. Maurice Lacroix features received a new brand to produce greatest swiss wrist watches one can possibly ever before come across. The corporation is located throughout hublot replica uk and has now been recently generating wrist watches considering that 1975. Their minimal format types determined by ancient moves remains to be recalled. Your format premiered with the level involving quartz situation. Street Style to Mom Style: Ready for spring!